When searching for a new apartment, it is in your best interest to use every tool available to make your search easy, quick and effective. Fortunately, there are many apps designed to help you find your dream apartment. Real estate apps let you conduct your apartment search at your convenience anywhere you are. Features like advanced search criteria, saved searches and notification alerts all allow to you to maximize your use of modern technology to most efficiently find the right apartment for you. When determining which app is right for you, remember you do not have to pick just one. If different apps offer different features you like, consider using more than one. All you need to check for first is compatibility with your portable device and operating system. Most apartment-hunting apps make use of your mobile device’s GPS to facilitate location-based searches. Make sure to activate your device’s GPS and enable location-based searching in the apps you choose to utilize. While there are many apps to choose from, the ones listed below are considered some of the best choices, as of writing. A streamlined apartment-hunting app, Abodo only has a small selection of choice search criteria that cover basic aspects like the number of bedrooms in a space. Click on a listing of interest to open a separate page over the general search results. You can then sort these listings for easy reference by popularity, recency, price and relevance. With this highly visual app, get a closer look at available apartments to consider by viewing high-definition photographs, videos, 360-degree tours and floor plans of various available spaces. There are even visual icons to help you quickly identify the amenities in a rental. Other app features include the ability to share listings with friends and save listings for later. There are several filters you can use to refine your searches. Most Apartment Guide listings come from big management firms. Apartments.com puts real-time listings in your hands. These listings update instantly as changes are made. If you are searching in competitive markets, this ensures you do not miss any opportunities. The default view of the app is a customizable map, with a polygon feature to carve out precise borders for your search area. The app offers an extensive array of filters to choose from for search results tailored to your needs and desires, from military or student housing to type of home and parking availability. Filter your search by your desired commute time using any transportation mode. You can even review neighborhood guides to learn more extensively about a new area. If you find an apartment you like, tour it online in 3D before even deciding whether or not to view it in person. If you have a busy schedule, this is one of the most useful apps to use. What makes this app stand out from the rest is the level of detail it provides about the buildings the apartments are located in. Discover building amenities and view photo and video galleries of the common spaces like vestibules and lobbies, elevators and stairwells, laundry and parking facilities. You can also view floorplans of the listed apartments. Most listings come from big management firms. Additional useful features include a rental calculator and moving quotes. A Zillow-owned product, HotPads offers detailed, in-depth apartment search functionality, including keyword searches. While the app is best in big cities, you can use it to find apartments anywhere in the country. It provides extensive neighborhood details, like schools and services in close proximity to properties. It even offers a “walk score” to indicate how pedestrian friendly a property may be. You can overlay filters atop area maps to see the proximity of bike lanes and public transportation. The app features hot listings flagged for all the interest they are garnering from other users. It tells you the length of time an apartment has been available. It also indicates the interest level in the apartment by showing the numbers of times a listing was viewed and how many times the listing agent was contacted. A useful feature allows you to view only listings featuring more than one photo. 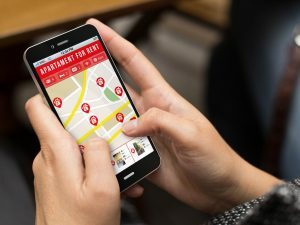 This app pulls from other real estate apps and websites including AirBNB, PadLister and ForRent to build a comprehensive map of local apartment rental opportunities. A convenient browser view lets you easily switch between multiple listings without returning to the primary map. A useful calculator helps you determine how much each tenant in a shared apartment would pay in rent. Listings can be favorited and hidden, as can geographic areas of particular interest. The notable feature of this nationwide apartment-hunting app is that once you find an apartment, you can pay your rent through it. Link your RadPad account to a credit or debit card, and the app sends your landlord a check with the rent while charging a small processing fee. This service can be used with apartments not partnered directly with RadPad. Trulia brings a solid history and reputation to the apartment-hunting industry, being one of the earliest rental apps available. Trulia partners with EveryBlock, SpotCrime and CrimeReports to help reveal the relative safety of the neighborhood where a given apartment is located. On the app, you can look up the commute distances and times, school districts and crime rates in an area. A one-click feature allows you to contact property managers instantly with no need to complete forms or search for a phone number. Zillow is one of the most impressive rental apps, with over 400,000 rental properties available as of writing. Customize searches based on features from on-site parking or laundry to pet policies. One unique feature of the app is the ability to customize your search by drawing a circle with your finger around an area on a map and see what apartments are available within the area. Zumper boasts over 1 million listings for apartments throughout the country. Click on a property to reveal details about it, including neighborhood culture, weather statistics and city landmarks. Set alerts to notify you when a new unit opens up in the area matching your criteria.